The last time the Seahawks faced the Bears at Soldier Field, it was for a trip to the NFC Championship, one year after Seattle’s Super Bowl run. Since that meeting, the Seahawks have been extremely consistent at one thing – losing on the road. Every major network providing picks before the games expected Chicago to win and only 7% of fans on Yahoo! Sports had the Seahawks picked to win. I suppose you can’t blame them for playing the odds, but it was great to see the Hawks win when nobody was even giving them a chance. Right out of the gate, though, the Hawks looked like they would prove everyone right. On the second play of the game, Roy Lewis was called on a 58-yard pass interference call, which led to an easy Bears touchdown. Considering the Seahawks hadn’t scored a first quarter touchdown all season, overcoming an early deficit was something they’ve become accustomed to, and a challenge they were ready to meet today. The Hawks didn’t waste any time erasing the deficit as they took only six plays to drive 80 yards in less than three minutes. Maybe Chicago was expected an early diet of newly-acquired running back Marshawn Lynch, but were instead attacked through the air. Two long passes to Mike Williams set up a 22-yard touchdown pass to Deon Butler who earned a starting spot after the departure of Deion Branch. Later in the quarter, after pinning the Bears on their own 5-yard line, Seattle got great field position when the Bears punted short and out of bounds. Again, the offense took less than three minutes, and just seconds into the second quarter put another touchdown on the board with a 9-yard run by Justin Forsett. Despite giving up some big plays in the second quarter, the defense came up big when the Bears got into the red zone. Seattle’s defense forced Chicago into settling for field goals on two long drives, which allowed the Hawks to take a 14-13 lead into halftime. Those big defensive plays weren’t limited to the second quarter. A big stat that stood out was the Bears 0% conversion percentage on third down, and the Seahawks defense sacked Cutler six times while only allowing the one offensive touchdown in the first quarter. Early in the third quarter, one of those sacks led to a Seattle safety that put the team up 16-13. Matt Hasselbeck continued to connect with Williams for some big plays in the second half. Coming up short of the goal line on one of those passes, Lynch was there to muscle through the defenders to get into the end zone and put the game out of reach. Although Lynch’s stat line of 17 rushes for 40 yards may not seem all that impressive at first glance, there were times when he was nearly caught for a deep loss and pushed through defenders and get back to the line. It’s going to be exciting to see what Seattle does on the ground in the coming weeks. Special teams even provided some huge help by mostly keeping the ball away from Hester and down half of Seattle’s 10 punts inside the 10-yard line. The one time Hester was able to get his hands on the ball with some room, he was able to run it back 89-yards for a touchdown at the two-minute warning. Not only did the score provide some tension at the end of the game as Seattle was forced to recover an onside kick to win, but it also led to a scary moment for Jon Ryan as he was annihilated while trying to tackle Hester on that punt return. Luckily he is still alive and x-rays on his ribs came back negative, and the Seahawks were able to recover and come away with a close win, 23-20. The Seahawks seemed to be clicking in every facet of the game today. I already mentioned the defense, but the offensive line did a great job of keeping Hasselbeck out of trouble, and as a result there were no sacks or interceptions. Forsett and Lynch combined for more than 100 yards on the ground. Mike Williams had his first 100-yard receiving game in the NFL, something Deion Branch only accomplished three times during his time in Seattle. The most impressive thing the offense was able to accomplish was scoring touchdowns and not settling for a field goal inside the red zone. Had they failed to score a touchdown on any of those three scoring drives, they ultimately would have come up short. Of course when the team’s number of punts reaches double digits, obviously it can’t be a perfect day for the offense, but their ability to score touchdowns made up for that stat. With the win and a Cardinals bye, the Hawks took a share of first place in the NFC West, but failed to gain any ground on the other teams in the division. The Rams continued to play well at home this week and took a big lead early on the Chargers and coasted to a 20-17 win. The 49ers picked up their first win at home against the Raiders. Surprisingly Alex Smith was left in the game after a horrible first half, which he overcame to throw two touchdowns in the second half. Next week the Rams (3-3) go on the road against Tampa Bay (3-2), and San Francisco (1-5) goes on the road against the Panthers (0-5). Considering how poorly the entire division has played on the road this year, we can hope it only means good things for Seattle this coming weekend. As the Seahawks come back home, a win over the Cardinals would make them the mid-season favorites to win the division. With the way they’ve played at home so far, if the defense can put the same type of pressure on Cardinals rookie quarterback Max Hall, the Hawks have a great chance to put themselves into that position. Now that Seattle has proven they can actually win a game on the road, we just have to hope they buck this year’s trend of bouncing back and forth with good and bad weeks. Brandan Schulze is a Navy veteran and member of the military chapter of the Sea Hawkers. 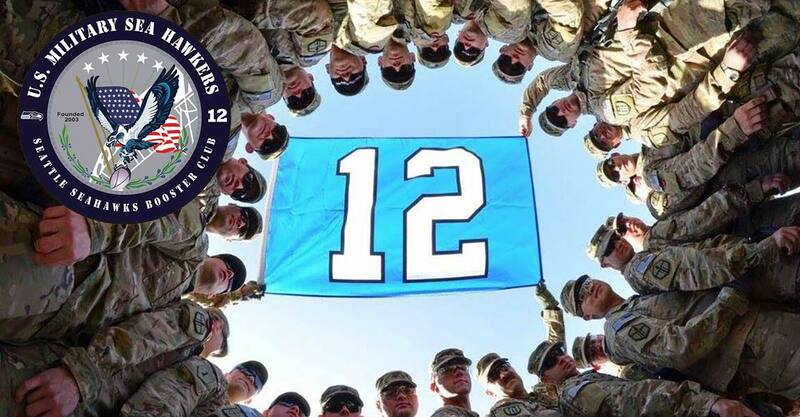 For more information on the chapter, visit www.militaryseahawkers.ning.com. Membership is free for all military servicemembers and veterans.